I don't know about you, but I really struggle when it comes to creating Sympathy cards. I used Kazan's wonderful Sketch#63 at 2S4Y as my starting point. 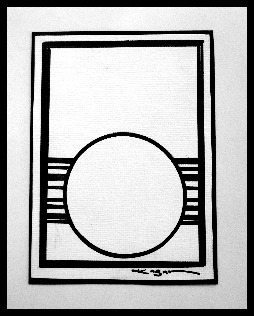 I thought about rotating the sketch, but it didn't work with the pattern paper, as the journal lines were going the wrong way. 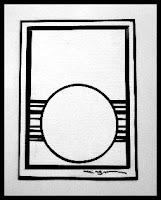 This is one of those sketches I can see myself using over again with many images or shapes in place of the circle. The Flower is cut from and old jean shirt that my DH was throwing away, so I thought I'd recycle it into my crafting. Speaking of recycling things - I had the Nate Berkus show on for background noise while I was in my studio and he made some fab pillows using clothes he bought from a second hand store. Sure makes you rethink throwing out worn clothing! This card also fits the challenge Simon Says Stamp and Show Some Metal (metal button embellishment). 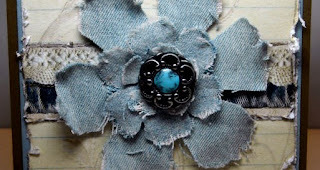 Fabulous denim flower! Love how you recycled the old clothes! Beautiful & elegant card! 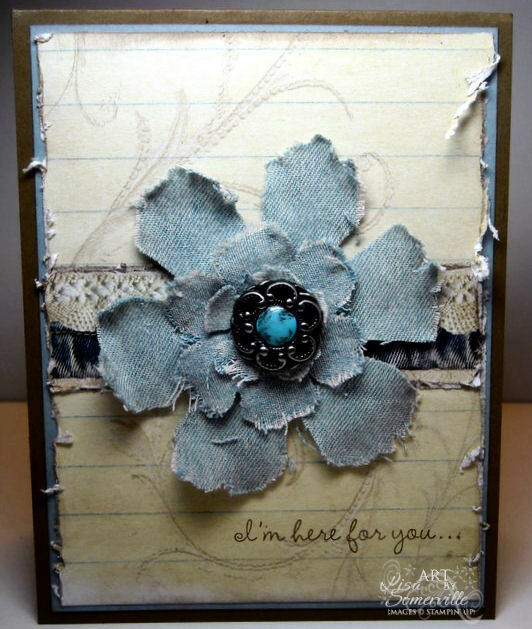 LOVE the distressed look and feel of this card which is perfect for a sympathy card! That flower is so FAB! Thanks so much for entering the Simon Says Stamp & Show Challenge!!! I don't think making sympathy cards is fun or easy for anyone. That is why I try to make 5 or so at a time...they don't have to be exactly the same. I think it is easier, because we are not in the stress and emotions that come with losing someone. Just an idea! I also save quotes that are great for this type of thing. What a great card! I, too, struggle w/ sympathy cards. I whip through them as quickly as possible because I HATE making them! It's so nice when you have a great sketch to help get that process started! Love how you recycled the jean shirt! It looks like you PLANNED it that way! LOL! Awesome! Gorgeous, Lisa! Soft and graceful! I agree, it is hard to make sympathy cards...especially when you actually need one. Absolutely agree! Don't quite know what to say or what to use. Your card is perfect way to let someone know you are thinking of them. Love the tattered flower and great use of used denim! Love this! Whoa! Love that flower! I would never thought a die cutter could handle fabric! I need to check my dh's shirts! Lisa, your struggle turned into a complete success!! It is a wonderful card which conveys much love!! thanks bunches for playing along with the Design Teamies and Simon Says Stamp and Show Challenge!! Love the look of the jean t-shirt flower, it's gorgeous!!! Great card, the combination is gorgeous.